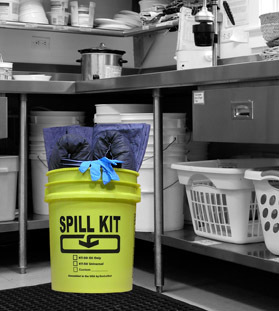 A spill kit designed for use in commerical kitchens and grocery stores. Perfect Spill Kit for Food Service areas and Grocery Stores - including kitchens, prep areas, storage areas and dish washing stations. Use this Spill kit where ever a liquid, chemical or grease spill is likely to occur. Contents will absorb water, petroleum products, chemicals, cleaners, body fluids, anti-freeze, vegetable oil. Container is 5 gallon pail with tear tab lid. Refill kit available. This spill kit is also available with a screw on/off lid. The pail is White.